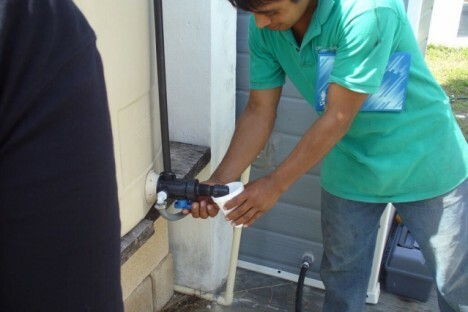 A team of MIT students and research staff have successfully developed a photovoltaic powered reverse osmosis (PVRO) for use in communities in need, now deployed and working in a small Mexican village. The community in question lacked dependable drinking water but receives plenty of sunshine to drive a solar-powered system like this one. Neighbors pitched in to build and run the apparatus. The result is a system that supplies water for about 1/10th the price of what can be found in the area, and with much greater reliability. The community stands to make thousands of dollars per year on the process, some of which will be invested back into the technology to keep it running and the rest going to voted-on projects. Eventually, they hope to turn it into a business and sell clean water to tourists visiting nearby Mayan ruins. The team’s next mission is to put systems in other needy communities, from jungle towns to crowded cities. The system’s design can adapt to different water qualities (utilizing a variety of different water purification processes, including reverse osmosis, nanofiltration, or electrodialysis) and its affordability makes it perfect for widespread use as well. See more in Medical Marvels or under Science. December, 2015.